First of all I want to wish you all a Happy New Year. May the year ahead bring you all the best from life! I was very busy this holiday season with work in the studio and outside the studio. Things are finally getting a little less hectic. I look forward to catching up with my favorite blogs and relaxing on a beach chair. The beach chair might have to wait as it's quite cold here in St. Augustine, Florida right now. Yesterday we had to bring all our outdoor potted plants indoors as temps dipped to below freezing. 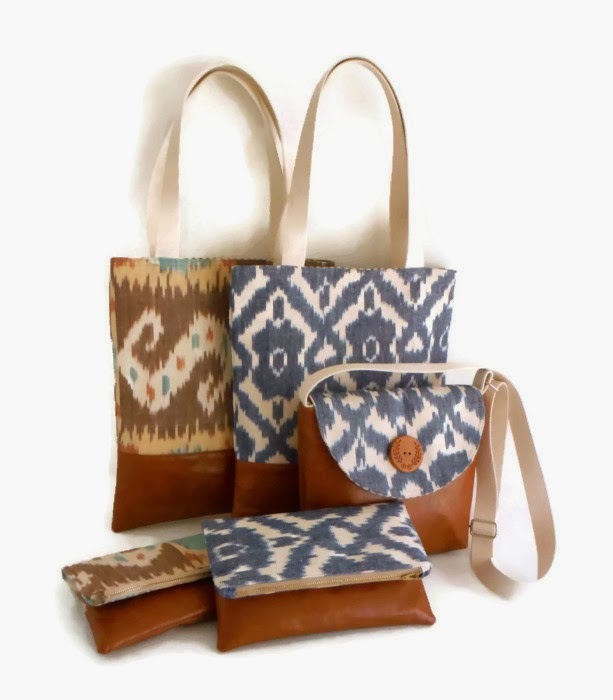 Today I stayed warm indoors and finished up a batch of new bags made with handwoven ikat. They are now available in the shop. Anni also stayed indoors. Even with her fur coat she thought it was a bit too cold for lounging on the balcony. But she still has her favorite grass plant to chew on that is now indoors so she is happy. It's so great to see Anni! Give her a kiss and hug from both me and Annie. I bet she misses her balcony time right about now during this cold spell that's hitting most of the country. We also wish you a very happy New Year and hope it brings you many good things! A masterly taken photo of your beautiful bags Elisa! Yael- I am also wishing you and your family a healthy, happy and wonderful New Year! Hello there! I just awarded you with a Liebster award. Would you like to take part? Zoe is wishing her friend Anni a great year too!!! :) She is missing her balcony time too in the winter, but she has a lovely sunny spot in the kitchen, where she loves to sleep and relax. Happy New Year. I hope that you and Annie are doing well.